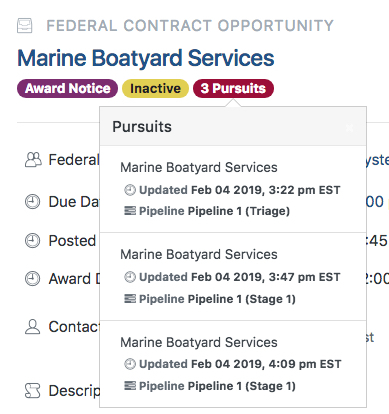 Pursuits can be linked to one or more government records that you can find on GovTribe - records being Federal Opportunities or Federal Awards. In this article, we will discuss how and why to link an opportunity or award to an existing Pursuit. This short video demonstrates and discusses linking an Opportunity or an Award to an existing Pursuit. A written walkthrough with screenshots is also included below. You have an existing Pursuit that is a re-compete opportunity - originally created from an Award - and the new solicitation was just released. Now you wish to link the recently released Opportunity to the existing Pursuit. 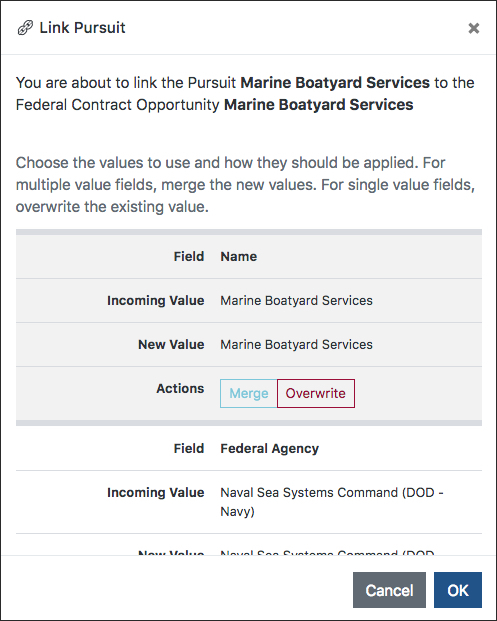 In either case, to link an Opportunity to a Pursuit, you begin by finding the Opportunity that you would like to link on either the Federal Contract Opportunity search page or the Federal Grant Opportunity search page. On each Opportunity, there is a Link Pursuit button in the upper right corner. When you click that button you are presented with a list of all your Pursuits. Begin typing the name of the pursuit to find the one you want to link to. Click the Pursuit to select it. After you click OK, the Activity Feed on the Pursuit will update to show you the changes. You will see the link from the Pursuit to the Opportunity in the Opportunities tab of the Pursuit. The relationship between the Opportunity and the Pursuit is also displayed on the Opportunity page itself. There will be a badge under the title of the Opportunity that shows the number of Pursuits to which the Opportunity is linked. You can click on that to view the Pursuit(s). It is often helpful or desirable to link an Award to an existing Pursuit in one of your Pipelines. The most common circumstance for this is if you have a Pursuit that is a follow-on requirement to, or a re-compete of, an existing contract (or grant). More specifically, it is very common to have a a Pursuit that was created from an Opportunity, but for which there also exists an incumbent contract. In this situation, it is useful to link that incumbent award to your existing Pursuit. It provides context for your current bid efforts, and it improves the fidelity of the Likely Bidders projections. On each Award page, there is a Link Pursuit button in the upper right corner. 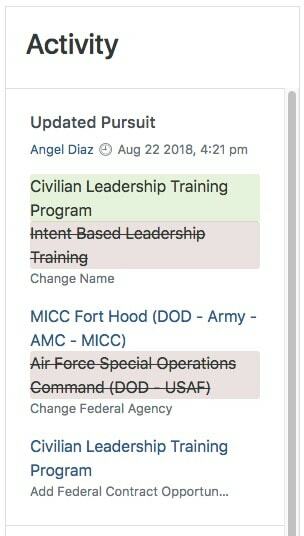 When you click that button you are presented with a list of all your Pursuits. Begin typing the name of the pursuit to find the one you want to link to. You will see the link from the Pursuit to the Award in the Recompetes tab of the Pursuit. The relationship between the Award and the Pursuit is also displayed on the Award page itself. There will be a badge under the title or the Award contract or grant number that shows the number of Pursuits to which the Award is linked. 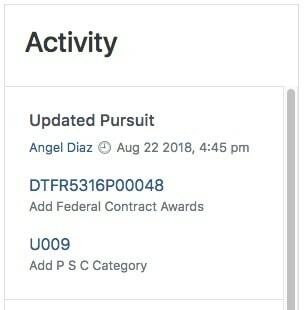 You can click on that to view the Pursuit(s).